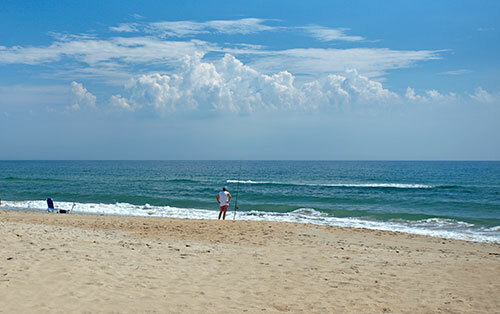 The Town of Southern Shores, NC, situated between Duck and Kitty Hawk, is predominantly residential. It’s made up mostly of year-round residents, but the town welcomes vacationers with nice accommodations near the ocean and a paved biking/walking trail that extends the length of the town. 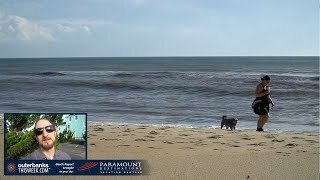 Southern Shores, NC, was one of the first planned developments on the Outer Banks, and many wish that the developers who came after would have taken extensive notes from this area. With much of its natural vegetation left intact, Southern Shores, NC, is a beautiful town. On the west side of town, a dense maritime forest of live oaks and pines makes for a cool, shady area that feels far from the ocean. Town leaders have maintained a quality over quantity approach to the additions that have come through the years, so your experience of driving through the quiet, back roads that wind throughout the town is much like it was several decades ago. Martin’s Point, a gated development located right before the bridge to Currituck County, followed in the footsteps of consciously blending the natural environment with high-dollar houses. Southern Shores is home to an elementary school and one of the best Outer Banks golf courses, Duck Woods. Southern Shores things to do, like much of the area, focus attention on the water. 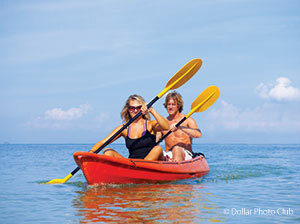 The Currituck Sound and the tributaries that flow into it provide gorgeous waterways for kayaking, and sailboats and motorboats dot the sound on every good weather day. You can wakeboard and waterski too! Or, gather a group of friends and go solve clues in an interactive escape room experience! Biking is popular on the dedicated path/sidewalk, or rent a beach buggie and explore the entire Outer Banks area. Golf is an increasing draw to the Outer Banks area, and Southern Shore's golf course, Duck Woods, is a long-established, upscale choice for a breathtakingly beautiful site that runs through a maritime forest. Since the focus of this town is residential, it isn't peppered with the same amount of retail options as other Outer Banks towns. But Southern Shores shopping still gives you what you need along with plenty of what you want. Some may appreciate knowing that the only Starbucks on the Outer Banks is located here. There’s also a Food Lion, CVS, UPS and several other shops, but its bordering towns offer many more options for shopping. In fact, right across the street, which is technically Kitty Hawk, you’ll find Walmart, Harris Teeter, Dollar Tree and other very familiar names. But there are also locally owned shops with fantastic clothing and home goods. While there aren't a ton of restaurants in Southern Shores, what's there is enticing. Like shopping, with the town border of Kitty Hawk literally right across the Bypass and Duck directly to the north, nearby restaurants are also a breeze to access. But right in Southern Shores, the restaurants range from an upscale oyster and wine bar and a higher end seafood-plus restaurant that's been popular for close to 25 years to particularly tasty pizza places. There's also the onsite restaurant in the Hilton Garden Inn. In between there are bagels, Chinese and smoothies. The only Southern Shores hotel is the multi-storied, oceanfront Hilton Garden Inn, a relatively new hotel that's gained a great reputation since its opening. It features an onsite restaurant that serves breakfast, lunch and dinner. The Hilton is located right beside the Avalon Pier, an Outer Banks landmark. The other options for visitors are vacation rentals along the oceanfront road and beyond. How did Southern Shores get its name? While many of the towns have fantastical stories behind how they got their names, the same can't be said for Southern Shores. Frank Stick, one of the developers of the town, chose the name as a marketing tool. Simple as that! Are there lifeguards and beach accesses in Southern Shores? There are four beach accesses in Southern Shores with lifeguards, but all are only open to residents and guests. None of these accesses have bathhouses or showers. Lifeguards are on duty from Memorial Day through Labor Day from 10 a.m. until 6 p.m. Always swim within sight of a lifeguard. The currents and shore breaks here on the Outer Banks are often much stronger than many people are used to, so extra caution is advisable. What makes Southern Shores different? Why vacation there? As we've described above, Southern Shores is primarily a residential community. While there are shops, restaurants and activities, they're all located at the southern end of town, which means that the road that runs north to through Southern Shores to connect with Duck as well as the back streets are 100% houses. So, you're as likely to rub elbows with residents if you choose a vacation rental house in this town as with other vacationers. That makes the experience quieter and more private – a definite boon to some.